Acute facet joint pain can be range in intensity from annoying to debilitating. Most cases of facet syndrome involve minor to moderate symptoms, but some expressions can be extremely painful. Acute pain is always the bringer of fear and anxiety, since it really prevents patients from living normally and often confines them to bed until it ameliorates. Recurrent acute attacks of pain can form chronic patterns of suffering that might terrorize individual patients and drive them towards even the most drastic treatments, such as spinal surgery. Acute pain prevents us from focusing on anything except our current suffering. The symptoms are sharp and intense, often occupying both body and mind with agonizing misery. Acute flare-ups of lower back pain or neck pain are primary reasons for many emergency room visits, although these attempts for get help notoriously provide unsatisfying outcomes for virtually all patients. This dialog examines the experience of acute facet syndrome symptomology. We will provide statistics on the level of pain usually suffered for each type of diagnosis, as well as detail the mindbody ramifications of acute pain on the psychoemotional self. Patient citations place facet joint pain rather low on the relative severity scale of dorsalgia diagnoses. Most patients report pain that is manageable, while only a minority report truly dire symptoms that prevent semi-normal physical functionality. However, the extent of facet damage and the mechanism of pain will influence the severity of symptoms to a large degree. Patients who suffer from osteophytes that literally prevent normal joint movement tend to have the worst pain upon mobilization of the joint. Compression of the small nerves within the facet structure can create sharp pain, but these symptoms are usually not as disabling. Although not qualifying to be called facet syndrome in the truest sense, facet osteophytes that enact a pinched nerve can create very serious symptoms, although pain is not always one of these expressions. Ligament issues range in symptomatic potential, as do inflammatory processes caused by swollen cartilage inside the joint capsule. Patients with frozen joints from extreme hypomobility might no longer suffer pain in the affected facet joint, but might begin to suffer pain in nearby tissues that must compensate for the restricted range of motion in the greater spinal anatomy. Although these statistics are provided, they are not written in stone. We have observed all severities of facet syndrome symptoms, ranging from inconsequential to disabling. However, just remember that as the severity of symptoms increases without a correlating degree of pathology, the chance for misdiagnosis also increases dramatically in proportion. Mechanical pain and internal neurological compression syndromes will usually be acutely symptom-producing when the affect joint is mobilized. Pain might occur during the full range of movement or only in a specific range of movement. Pain is unlikely to change once a pattern has been established, but may ameliorate organically if an offending bone spur naturally wears down or breaks off out from the interactive zone of the joint. Pinched nerve symptoms might begin as localized pain and discomfort in the innervated area of the body. Typically, if compression continues, the symptomology will rapidly progress to tingling, numbness, weakness and utter dysfunction of that innervated muscular grouping. 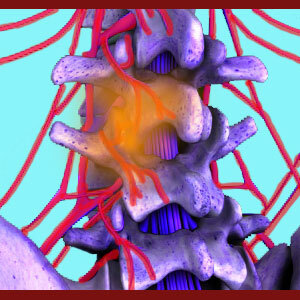 Some patients will experience a sensation of heat in the affected facet joint. This might indicate inflammation, but is also commonly associated with nerve compression. Feelings of tension and tightness in the affected region all of the spine are very common, regardless of the mechanism involved. Some patients might suffer frozen facet joints due to extreme hypomobility that may influence the functionality of related structures and possibly create cascade effects of pain and/or dysfunction. Similarly, hypermobility of the facet joints can create spinal instability and additional symptoms throughout the entire backbone. Acute pain is always fear-inspiring and really affects the emotional state of the patient while it endures. Patients are worried that something must be really wrong in their spine in order for them to endure such severe suffering. They also have anxiety about the duration of the symptoms and how the pain will influence their lives if it does not resolve. All of these consequences can be aggrandized by the pronouncement of any structural diagnosis and the worst nomenclature, such as “facet joint disease”, can really spell dire effects on the psychoemotional state of the patient. We can say for sure that the severity of pain is not always an indicator of the actual clinical severity of the structural issue, so patients can take comfort in this indisputable truth. In fact, many facet pain syndromes are nonstructurally-motivated and reflect completely normal degrees of degeneration in the joints, yet produce very disabling symptoms. For information on these interesting nonstructural issues, please continue to research our coverage of mindbody pain syndromes.